When I wrote my initial impressions for Dux, I described the game as an interesting visual experiment designed for a specific demographic. However, once I spent more time with it to review, I realized the game was virtually unplayable due to bizarre design choices, such as a control scheme that can cause corpal tunnel syndrome coupled with an insane difficulty to artificially inflate the game’s short length. Hucast quickly realized that they had released a fundamentally flawed game and announced Dux 1.5 as a free revision disc for all who had purchased the original or as an exclusive with Redux: Dark Matters Limited Edition. As Redux’s release date repeatedly got pushed further and further, Hucast decided to issue a standalone release; On April 22, Dux 1.5 was released. Many in the Dreamcast scene believe that Dux 1.5 is nothing more than a bug fixed version of Dux with instant respawn. Well, I have been playing both games for a couple of months, and I have found significant differences between them to warrant two separate reviews. Photo courtesy of The GagaMan. Almost nothing. The game’s packaging is austere with almost no description on the game’s case and the manuals are non existent. Given that Dux 1.0’s instruction manual was instrumental in helping me understand the mechanics of the game, it is an inexcusable omission especially since there isn’t a functional tutorial inside the game. That said, the packaging can vary depending on the edition you own. As I mentioned in my review for DCS: 2013, Dux 1.5 is the most prolific game on Dreamcast, and Hucast continues to release new editions for the game with the Collector’s edition being released on April 28. 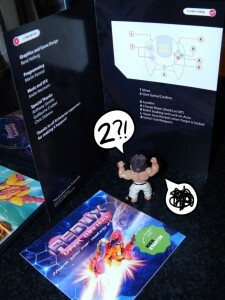 As you can see in my hands on video, I ordered the game with Redux LE, and I have to say the packaging is certainly inferior to the original. So what’s are we looking at? Visually, the game is identical to the original, which is fine as the graphics were the best part, and they remain the same in Dux 1.5. The only graphical difference is that the image on the title screen has been changed with the box art of Dux 1.5; other than that, all six stages, and, for better or worse, the six huge bosses remain untouched. Dux 1.5 looks visually identical to the original game. Well things are much more polished this time around, and the score keeping bug and physics glitches have been fixed. That said, Dux 1.5 is not just a simple patch job. 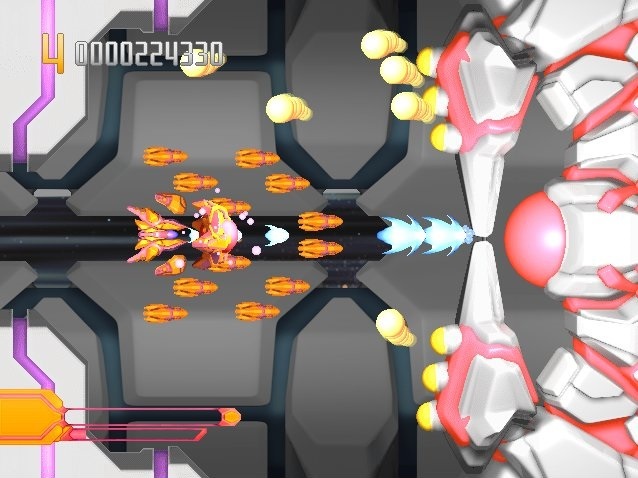 The control scheme has been revamped; instead of button mashing, the player can simply hold down the fire button, and the ship will continue to fire repeatedly. Another source of contention for me in the original was was that the gameplay was regulated by collecting power ups in the environment rather than the controller as you could not toggle between weapons. Dux 1.5 fixes that problem somewhat. There is now a command to toggle between horizontally or vertically firing sub weapons (drones). However, you still can’t toggle the main weapon. This is especially odd as the controller still has one idle button with no purpose for it. Additionally, the health of the ship and enemies have also been adjusted. The ship can now endure a few collisions with the terrain where as bosses and enemies take significantly less attacks to be defeated. Furthermore, those infuriating floating cell structures from level 5 no longer need to be dodged as they can be absorbed by the shield. All these changes to the enemies and obstacles greatly reduces the difficulty but contributes to a far more playable experience. Lastly, the checkpoint system has been substituted for instant respawn however the check points are still present in the game and if collected, the player will start from the checkpoint when they use a continue. Oh, yes. Dux 1.5 offers an entirely remixed soundtrack; however, the in-game sound effects, which were lacking in Dux 1.0, are the same. Andre Neumann has wasted time and resources remixing the music given that most people who couldn’t get past the second stage in the original game wouldn’t have heard it in the first place, yet they will all notice the inadequate sound effects. Oh well, at least the water falls in the second stage sound nice. What’s to keep you coming back? Dux 1.0 offered terribly little for some reason, and project lead Rene Hellwig decided to trim away the only thing that the previous game offered. My favorite feature of Dux 1.0 was the perfect visibility mode – an option to substitute background animations for a white background. Also, since the difficulty has been reduced, even casual gamers should be able to beat the game without even comprehending the game’s unique gameplay mechanics. 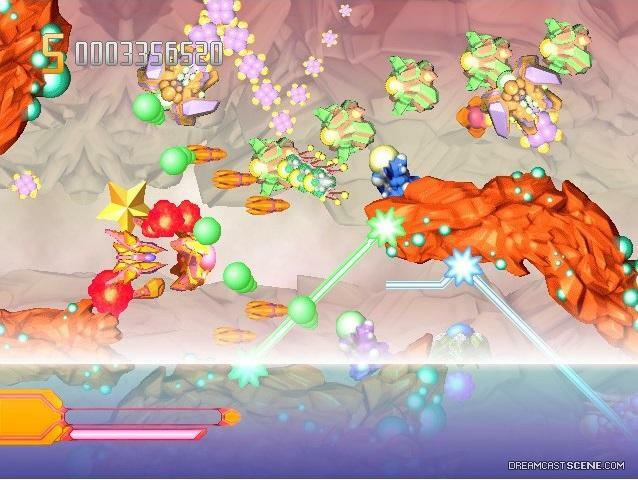 The original game, for many, was almost unplayable, and now, by successfully revamping the control scheme, Hucast has made the game quite enjoyable. However, by reducing the difficulty without providing options to choose difficulty modes makes it less engaging. It’s hard to understand why there are no additional gameplay modes the second time around. It all seems like a twisted strategy to force consumers to buy both versions. Fortunately, the game was given away for free to everyone who had purchased the original. The problem is that if you’re reading this review, chances are you don’t own the original; hence you are planning to buy it. Given that most retailers stock it for $50 these days, I don’t think paying full price for a half-hour experience makes any sense. Collector’s would be better off buying the original, and casual fans should redirect their attention towards any other shoot ’em up but this one.